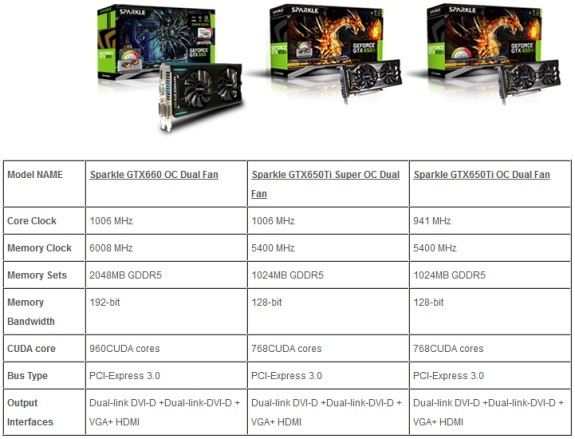 Sparkle brings three new overclocked graphics cards to the market with a dual-fan cooling solution; one GeForce GTX 660 model and two GeForce GTX 650 Ti variants. Sparkle, one of the leading manufacturers of graphics solutions today releases the powerful Dual Fan series– SPARKLE GTX 660 OC Dual Fan, GTX 650Ti Super OC(SOC) Dual Fan and GTX 650Ti OC Dual Fan. The latest Dual Fan series features default overclocked setting, with up to 1006MHz core speed, the Dual Fan series delivers turbocharged performance, maximizing the possibility of gaming effects. Equipped with 4-pins PWM dual fan design, the SPARKLE Dual Fan series allows a low noisy level through automatically fan speed controlling by detecting GPU temperature, easily delivering superior cooling performance through ultra thin cooling fins fully covers the key components, enabling the most efficient heat dissipation effects. The latest series provides the ultimate overclocking gaming experience and the best cooling efficiency without any compromise. The SPARKLE Dual Fan Series features low power consumption, enhanced power efficiency and low temperature, creating an environmentally friendly platform and a better user experience. Furthermore, the latest series supports all the key graphics technology- Microsoft DirectX 11, NVIDIA PhysX, NVIDIA CUDA, NVIDIA Surround and Adaptive V-Sync, allowing a HD entertainment experience like never before.